Two years ago, we went to Wisconsin in December for my exceptional grandson Cam’s birth. While there, we went to Discovery World Science and Technology Center. 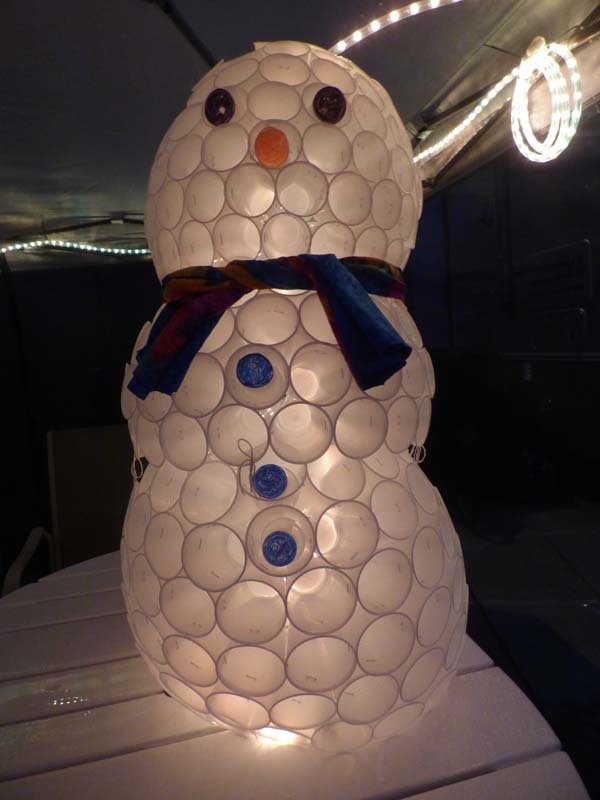 Just inside the door was a snowman made of plastic cups. Here is Daughter Jennifer holding newborn Cam and admiring the snowman. I was charmed. 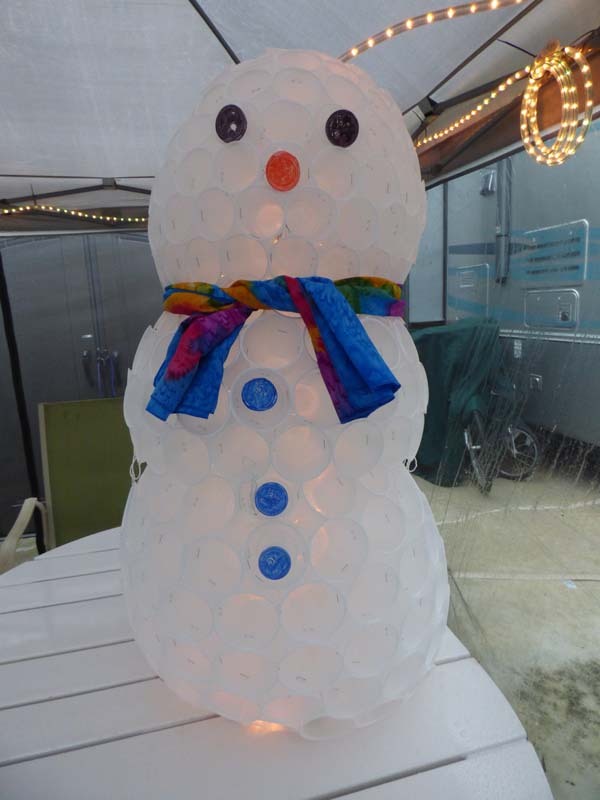 I vowed to make a snowman for myself, even though I think it is silly to have a snowman in the Florida keys. We came here to get away from cold and snow, after all. This is the year. We drove to Key West, to the restaurant food store, and bought some plastic cups. Then I started stapling them together until I got a cramp in my hand. I am not a craft person! My snowman is uneven and crooked. He tilts forward. Some of the cups stick out uneven with the ones around it. The three sections don’t match up very well. He was pathetic. But after I painted the bottoms of some small cups with Magic Markers to make eyes, nose, and buttons and then put a scarf around his neck. He looked great! We stuck a rope of lights in the top of his head and this is what he looks like at night. Andy named him Cuppy. He is about 40 inches tall, bigger than I expected him to be. It has been raining for days and days. My garden is growing. We have a large crop of tiny green tomatoes. I just hope they make it to harvest. The iguanas are a problem here. Great attempt at crafting! 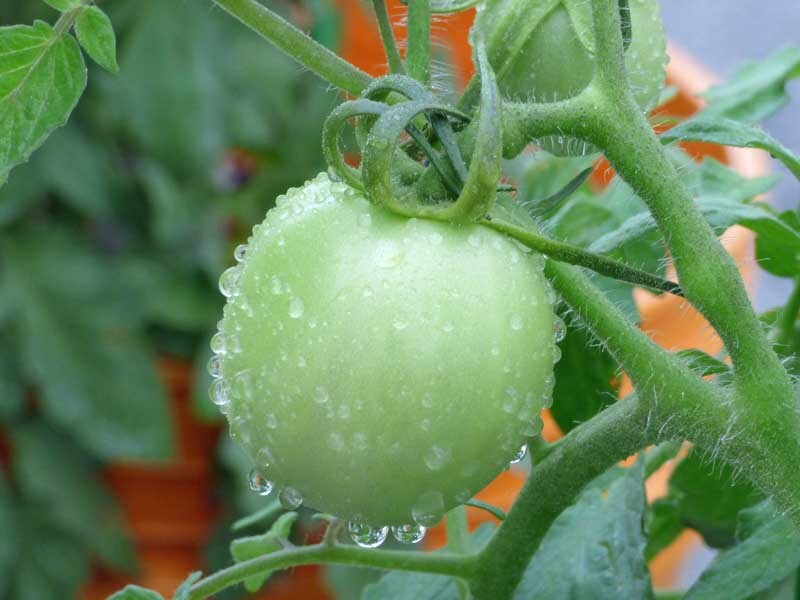 Love the last image of the wet tomato. Thank you. It was really fun to see him “come to life”. Thank you. It was fun too. Would a plastic netting of some kind help to keep the iguanas away? I was thinking of some kind of netting. I used it in my garden in Maryland to keep away birds, squirrels, deer, groundhogs, and whatever else was nibbling in there. I’ll have to look around for some. Thanks for reminding me. You are right. He is beautiful in his flaws. Well, stop by and see him in person! I’ll make a pot of coffee. I am really impressed! wow cuppy is so cool! I want to make one! Thanks Lynn. It was fairly easy. I bought three different sized cups so the three sections would be different sizes. Just lay the first layer on the table or floor and staple the cups side by side in a circle (which naturally forms due to the shape of the cups). The trickier part for me was the next layers. It is important to keep them centered between the lower cups. I didn’t do a very good job of connecting the sections. The middle one needs another layer on its bottom so it isn’t bigger than the bottom layer. We love him anyway! He looks fabulous! 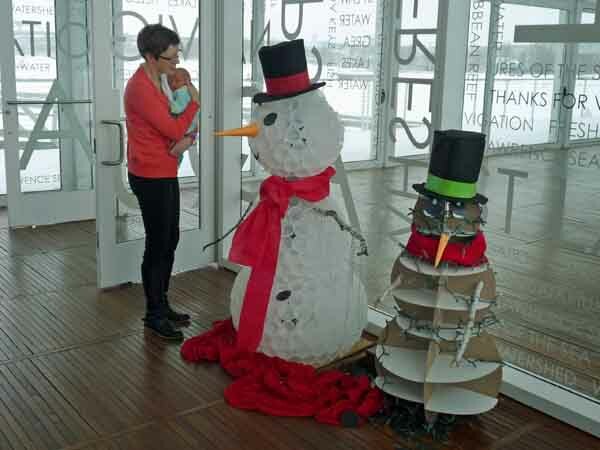 We all have imperfections Dinata, including snowmen! What a sight to see at night! Great job! Thanks! I keep saying I want to add another row of cups to the bottom of the center section to make it match up better, but Andy insists he is fine just the way he is. What a fantastic effort with your snowman. He’s great – imperfections or not! For someone who isn’t a craft person, you’ve done brilliantly with Cuppy (great name, too!). Cuppy would look excellent in our conservatory. Hope the iguanas find something else to eat and leave your tomatoes alone. Thanks. I am really enjoying looking at him, especially at night when the lights are on. Andy insisted that we keep him under the canopy so the cups don’t fill with rain. He is huge up there on the table where we eat our meals! He’s cute! I can’t believe I missed this post. Thanks. It was fun too. Glad you liked the snowman. It was fun to make in spite of a cramp in the stapling hand.